Size of Baby: An ear of corn (12.5 inches). Gender: A girl! Still deciding on names. Weight Gain: Gained two pounds this past week! Up a total of 8 pounds from my pre-pregnancy weight -- but since I lost a few pounds in the first trimester, up 11 pounds total from that lowest weight. 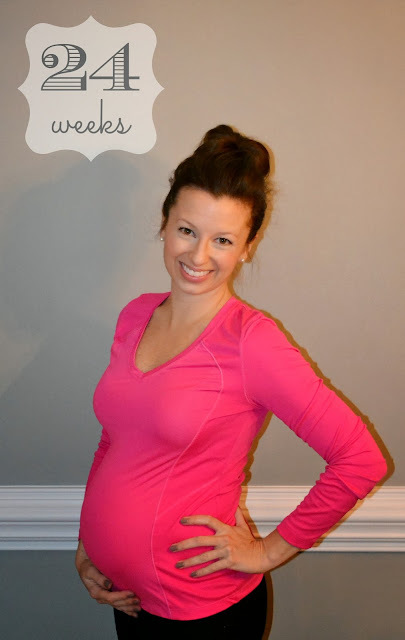 Maternity Clothes: Occasionally I can wear non-maternity tops, but I'm in maternity pants and leggings nearly every day. Loving empire waist dresses with tights and boots! Nursery: So far all that I have is decorative. But we did take down the bed in the guest room this past week and donated the mattress and box springs to the Salvation Army. With our new bedroom dresser now housing all of the clothing that was in the guest room, it's almost ready to become our new office, making room for the nursery! On the task list: closet re-do, painting the walls, getting fabric samples for drapes, and the crib/bedding situation. Movement: Lots and lots. This weekend was the first time that I was feeling a large mass (felt sort of like a big knot) so I'm guessing it was her head? So cute. 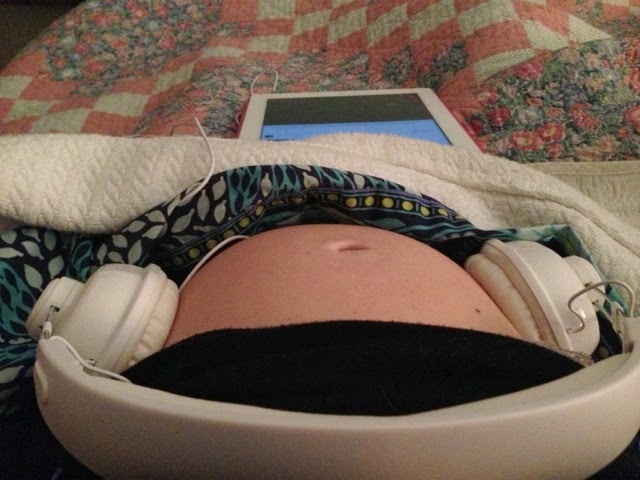 Also, this was the first week that we tried headphones on the belly! It's become a fun nightly routine to play Beethoven and Mozart baby lullabies to her. I also gave her an introduction to Beyonce on Friday night. Baby girl loves "Halo" just like her mom. Whenever I'm playing music for her, she dances and moves all over the place! Symptoms: Big appetite, big belly. No stretch marks, no hand or ankle swelling (rings still on, the weekly photo was literally taken at 7:00 this morning when I'd only been awake for 20 minutes!). Popping out of bed isn't happening anymore, one because I love sleep nowadays, and two because it's more of a rolling/falling out of bed situation. Also, my belly button is so shallow now -- no doubt it will be flat or out soon. Sleep: Still sleeping great (on our mattresses on the floor). Cravings: None really to speak of. What I Miss: Ehh, nothing major. Nothing that is not worth the wait. Best Moment This Week: My doctor's appointment went really well. Baby's heartbeat was 143. Also, we had friends over for the Panthers game (including my ADPi little sis, who will be moving to Charlotte soon from Atlanta -- she is about 6 weeks ahead of me with a baby boy!). There were some children there and I loved it when one of our friends' son was talking about the "baby in Miss April's belly." Looking Forward To: Babymoon planning! And the potential for a mini-babymoon this weekend?! Looking great Momma! Ohhh a mini babymoon and a babymoon- lucky lady!! Enjoy it and relax! Lookin good, mama! I love that last pic of you. Your hair is off the charts amazing right now. We started playing music this week too - so fun! And yay for some nursery progress! You look so very cute:)! Enjoy this time, the end comes quickly!!! What a fun time, enjoy it! You look gorgeous! You are so cute! It sounds like everything is going great, and it's awesome that your friend is pregnant at the same time as you! I cannot get over how great you look! Pregnancy looks so good on you! You are too cute! I am loving watching you grow! We are so bummed about the Panthers. Isn't it CRAZY when you feel their whole body start to roll and shift in there? Pregnancy is so wild and amazing! You've really popped!! Where are ya'll headed this weekend? You are glowing!! The babymoons sound perfect- enjoy them both and relax! !